At Tomlinson & Carruthers we undertake a variety of projects. Please select a category for some recent examples. Short Description Design, Planning, Topographical Survey, Urban Design, Civil Engineering, Subdivision Survey, Setout & Project Management of urban light industrial/ heavy commercial development. Detail The site bordered by State Highway 2, the Masterton bypass and the Wairarapa Railway Line was ideal for a heavy commercial and light industrial park. 20 lots of between 1000sqm and 5555sqm were designed to provide efficient access to infrastructure and minimize conflicts with neighbouring uses of land. 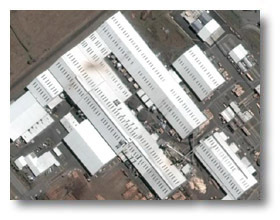 The site bordered by State Highway 2, the Masterton bypass and the Wairarapa Railway Line was ideal for a heavy commercial and light industrial park. 20 lots of between 1000sqm and 5555sqm were designed to provide efficient access to infrastructure and minimize conflicts with neighbouring uses of land. The design of the road network was the most important aspect of the design for the subdivision. While access to the State Highway frontage was not desirable, the access corridor to the bypass was adjacent to a primary school. The solution was an integrated traffic management plan incorporating the relocation of pedestrian crossings and redesign of parking, intersections and railway crossings. 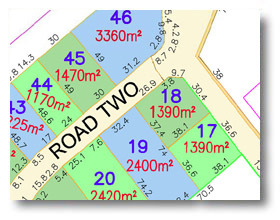 The development has been a resounding success with the last lots sold in 2006. The scheme plan for the development. Central to the design of the development was the provision for heavy vehicle access. An aerial photograph of the completed subdivision. Short Description Design, Planning, Topographical Survey, Urban Design, Civil Engineering, Subdivision Survey, Setout & Project Management of rural industrial development. Detail Waingawa has been identified as one of the key growth areas of the Greater Wellington Region. The Gillies Group shared this vision when they approached Tomlinson & Carruthers to design and implement an industrial subdivision on the outskirts of Masterton between the State Highway 2 and Wairarapa Railway. As part of the planning process Tomlinson & Carruthers were involved with consultation with Transit New Zealand, the Carterton District Council and the Greater Wellington Regional Council to ensure that the future development area had the optimal integration of infrastructure. Our team of surveyors and specialist staff designed and are monitoring the construction phase and will project manage the project until completion. 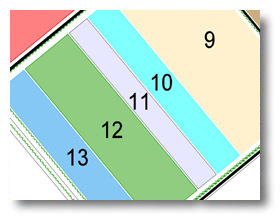 A scheme plan of the development. An essential element of the design of the development is the integration of services with the road design. 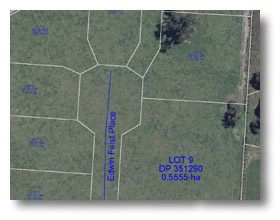 An aerial photograph of the Waingawa Area with the scheme overlaid. The location, between the railway and roading arteries so close to an urban area is ideal for rural industrial development. Job Winery & Cellars Project. 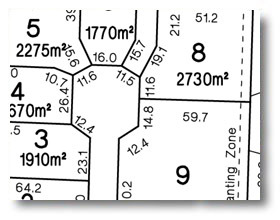 Short Description Planning, topographical survey and setouts. Detail Tomlinson & Carruthers have been involved with several stages of the development of Thomsons Trail Winery ranging from the first setout of the vines, to the topographical survey for the irrigation dam to the more recent planning for the winery and buildings. The team at Tomlinson & Carruthers have experience with the viticulture industry and Thomsons Trail Winery recognised this when they approached the firm. 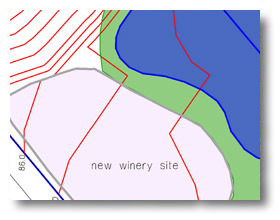 A topographical plot of the new winery site and irrigation dam. A schematic of the vineyard site showing the location of grape varieties, irrigation infrastructure, buildings and access. Short Description Setout of industrial buildings. Detail When the foundations for a building with dimensions of almost 200 metres in length need to be set out, and most of the building components are pre-fabricated off site, precision measuring equipment is required. Tomlinson & Carruthers set out the foundations for the buildings using a combination of laser assisted total stations and Global Positioning System surveying equipment to ensure accuracy to within millimetres. 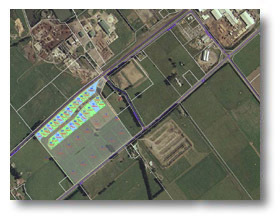 Aerial photograph of the JNL site at Waingawa. Some of the buildings are almost 200 metres long.